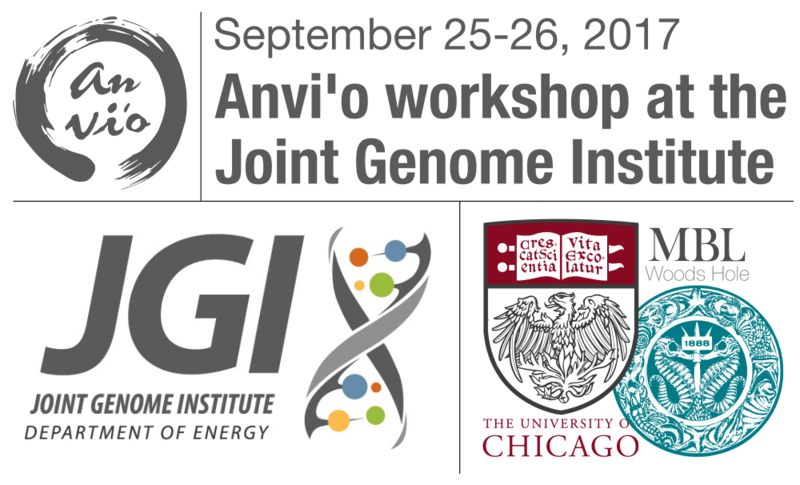 Just a quick post here about an upcoming anvi’o workshop at the Joint Genome Institute (JGI). While I’ve never used anvi’o myself, I know that people rave about it and the visualizations it produces look really cool. It can be used with metagenomic, genomic, and transcriptomic data. Information below copied from the workshop website. Soon after the anvi’o workshop at the University of Chicago, we are happy to announce another 2-day workshop at the Joint Genome Institute. The details of the workshop and the schedule will be here, but here are some quick facts. The workshop will take place at the JGI (which is located in Walnut Creek, California) on the 25th and 26th of September, 2017. The workshop is free and open to public, but the space is limited. There will be 45 attendees in total. 20 of these seats will be JGI scientists, and we have space for 25 attendees from other universities and institutions. If you are interested in the workshop, please fill out this application form at your earliest convenience: https://goo.gl/forms/ZyUnNcTF7C9s6U182. The application deadline is August 1, 2017, and before August 7, 2017, we will send e-mails to everyone who applied. Why are we doing “applications” rather than filling up the available seats in a first-come-first-serve basis? We did the latter for the workshop in Chicago, and some of our colleagues mentioned that when they heard about it, all seats were already taken. This approach will certainly be more fair and inclusive with respect to how people access to this information, however, it will be challenging for us in case there are more than 25 applicants at the end. If we have to select a final 25, our selection criteria will only ensure that the list of attendees is gender-balanced, increases the diversity of represented institutions and universities (so attendees have some networking opportunities), and backgrounds (so there are different perspectives). If you end up coming, we will tell you about how to visualize complex data using anvi’o, as well as working with genomes, metagenomes, metatranscriptomes, and pangenomes in anvi’o. You will also hear about other things including single-nucleotide variant detection and profiling, or refining of metagenome-assembled genomes. Considering the fact that we will be surrounded by experts at the JGI, there will be room for many spontaneous discussions regarding ‘omics data analysis and data visualization. We are hoping this will be an opportunity to learn from each other in a friendly environment. Although we will keep things as simple and as clear as possible, we encourage you to consider attending this workshop if you are a software developer or a power user. You are a perfect candidate to attend to this workshop if you have genomic / metagenomic / metatranscriptomic data, and you explore best ways to analyze them. This workshop wouldn’t be the best use of your time if your current endeavors exclusively revolve around marker gene amplicon data. We will have example datasets for you to follow everything on your anvi’o installed computers, but feel free to bring your own datasets. Meanwhile, certain steps of genomic / metagenomic data analysis takes time, and focusing on concepts and asking specific questions about how to apply some of them to your data may be much more useful way to spend your time. You will have access to snacks, water, tea, and coffee, internet, electricity, chairs, desks, and restrooms (yay!). But you will need to take care of your travel and accommodation (if you are going to be coming to the workshop from elsewhere). We will keep this page up-to-date as things progress, but please use the comments section to ask questions.